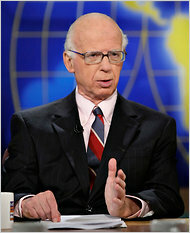 David S. Broder, who skillfully straddled the line between commentary and reportage for more than four decades as a political correspondent and columnist for The Washington Post and who spread his influence on television as a Sunday morning pundit, died on Wednesday in Arlington, Va. He was 81. The cause was complications of diabetes, The Post reported. Mr. Broder, whose last column was published on Feb. 6, was often called the dean of the Washington press corps and just as often described as a reporter’s reporter, a shoe-leather guy who always got on one more airplane, knocked on one more door, made one more phone call. He would travel more than 100,000 miles a year to write more than a quarter-million words. In short, he composed first drafts of history for an awful lot of history. Mr. Broder’s profile was national: his column was syndicated, and he made more guest appearances on “Meet the Press” than any other journalist. His writing life spanned 11 White House administrations, beginning with Dwight D. Eisenhower’s second term, and his career as an observer of Congress was longer than Senator Edward M. Kennedy’s tenure as a member of it. Indeed, he covered Mr. Kennedy from before his first election in 1962 through his struggle with cancer and death. Mr. Broder reported on and analyzed a dozen presidential campaigns for The Post, including the one in 1972. Early that year he broke the story that Senator Edmund S. Muskie of Maine, infuriated by attacks on him and on his wife by William Loeb, publisher of The Manchester Union Leader, during the New Hampshire Democratic primary, had wept as he held a news conference on the steps of the newspaper during a February snowstorm. Mr. Muskie said later that he had been wiping snow from his face, not crying, and he went on to win the primary. But the perception of him as overemotional damaged his campaign and contributed to his failure to gain the nomination, which was won by Senator George McGovern of South Dakota, who was defeated in a general election landslide by the incumbent, President Richard M. Nixon. For his columns that year, Mr. Broder won the Pulitzer Prize for commentary, his analysis of party politics favoring neither one side nor the other but bringing equal measures of frank admiration and, just as often — perhaps more often — spitting disdain to both. His writing style could be pedestrian, but his strengths were in reading the electorate and in parsing the ambiguities and contradictions of the policies and characters of the candidates and their parties. Mr. Broder’s reputation for doggedness was legend. In August 1968, after Mr. Nixon had unexpectedly named Gov. Spiro T. Agnew of Maryland as his running mate, Mr. Nixon said publicly that the only one who was not surprised was Mr. Broder, who had wheedled the information out of Mr. Nixon himself — and had written it — some months earlier. Few, if any, other journalists walked the tightrope between news and opinion as effectively as Mr. Broder. But he had his moments of false prophecy and crossing the line. In 1976, he reported that Morris K. Udall of Arizona had won the Wisconsin Democratic primary, only to learn a few hours later that the winner was Jimmy Carter, then governor of Georgia. Mr. Broder submitted his resignation, only to be talked out of it by The Post’s editor, Benjamin C. Bradlee. During the impeachment of President Bill Clinton, he wrote critically of the president and later expressed his personal disdain for him in an interview. The Post curtailed his news reporting on the story. And in recent years he wrote admiringly of Karl Rove, President George W. Bush’s former adviser, leading some critics, especially bloggers, to rail against him as a hopeless Washington insider and a Republican mouthpiece. David Salzer Broder was born in Chicago Heights, Ill., on Sept. 11, 1929. He attended public schools there and graduated in 1947 from the University of Chicago, where he was editor of the newspaper and earned a master’s degree in political science in 1951. After two years in the Army, he worked for a newspaper in Bloomington, Ill., The Pantagraph, then moved to The Congressional Quarterly in 1955. Five years later he left the Quarterly for The Washington Star, and in 1965 The New York Times hired him as a political reporter. His tenure at The Times was brief and unhappy. When he switched to The Post the following year, he left behind a stinging memo criticizing what he called the “endless bureaucratic frustrations” and “parochialism of outlook” at The Times. By then he had begun almost a second career as a panelist and commentator on television news programs. Slender and bookish-looking, articulate with a considered way of talking though not especially expressive, Mr. Broder was an unlikely television personality. But he came across as sober and reliable, and he became a star of the punditry culture. Mr. Broder was the author or co-author of seven books, including “Behind the Front Page” (1987), an examination of how the press covers politics. He expressed disapproval of the seemingly open door between journalism and politics that allowed people who have served in government or on campaigns to become commentators, taking to task, by implication if not by name, well-known figures like Mr. Safire and Mr. Begala. He also objected to the culture of celebrity journalists, though his television punditry and the many speaking invitations it brought made the complaint more difficult to defend. In 2008, Ken Silverstein, the Washington editor of Harper’s magazine, disclosed on his Washington Babylon blog that Mr. Broder had accepted paid speaking engagements that violated Washington Post ethics guidelines. Mr. Broder was rebuked in the pages of The Post by its ombudsman, Deborah Howell. He apologized. Mr. Broder is survived by his wife of 59 years, Ann, and four sons: George, of San Francisco, Joshua, of Brooklyn, Matthew, of Hamden, Conn., and Michael, of Arlington, and seven grandchildren. His colleagues at The Post spoke of him with familial fondness, remarking that he had the messiest office space in the newsroom, that he was generous to young reporters and frequently willing to share a byline, and that he was slow to adapt to technology. He found it difficult at first to compose at a computer, and for one election cycle he traveled with both a typewriter and computer in tow, writing his stories on the former before copying it secretarially on the latter. Mostly, though, they marveled at his skills. Maralee Schwartz, who edited Mr. Broder at The Post for more than a decade, recalled in a telephone interview that in 2003, when the House of Representatives passed a measure to add a prescription drug benefit to Medicare after a contentious debate that resulted in an all-night session, Mr. Broder, then 74, was virtually the only reporter who stayed to the bitter end.